Incredibly durable and user-friendly, the economical MF mechanical force gauges are excellent for push/pull force testing in manufacturing, material testing, maintenance and inspection applications. 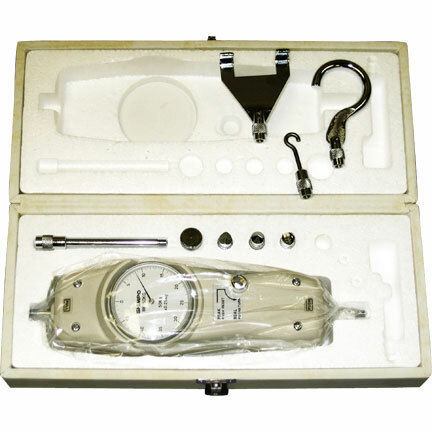 Incredibly durable and user-friendly, the economical MF mechanical force gauges are excellent for push/pull force testing in manufacturing, material testing, maintenance and inspection applications. The peak force mode features an easy push-button reset; this is especially helpful for doing repetitive testing in an assembly line or in quality control. The large dial indicator allows viewing of force changes as they occur. This large dial reduces the chance for parallax errors when taking readings. The MF was ergonomically designed for handheld use, but may also be used with the optional handle-great for loads over 15 pounds (6.8 kg). Due to its mechanical design, response time is immediate. Calibration is achieved by a set of precisely matched springs which are overload protected to 165 pounds (75 kg)! MF gauges feature a die-cast aluminum housing which mounts easily to all Shimpo Instruments test stands for even greater control of repetitive testing. 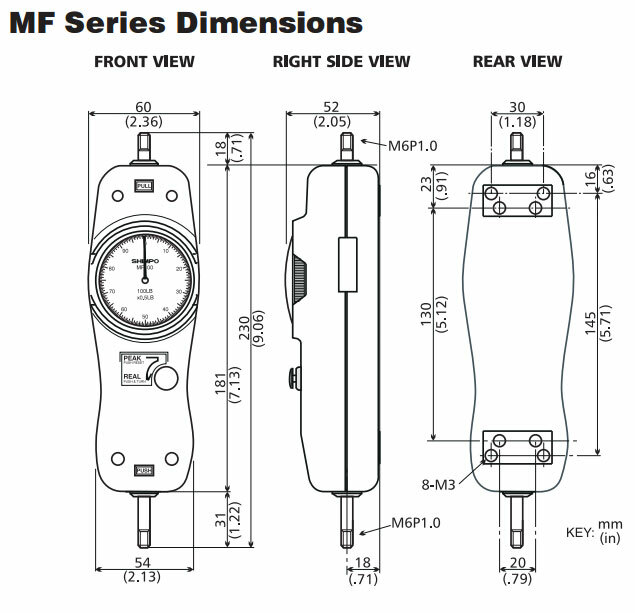 All standard Series MF gauges include a protective carrying case plus attachment adapters. A complete kit is available that includes adapters, padded ERGO accessories, handle, large rugged case and NIST traceable certificate. This kit is perfect for the professional Physical Therapist or Ergonomist that performs Isokinetic testing or job task analysis.